Women and men alike are on the lookout for the best anti aging cream. There are lots of companies claiming to offer the best anti aging cream, however finding one that really works can be somewhat of a challenge. Your search does not have to be difficult. The power of the Internet provides a great resource for anti aging products. So what are some tips for choosing a skin care cream to reduce those fine lines and wrinkles? Look for products that have all natural ingredients. Check out the people behind the company. Base your buying decision on solid information, not hype, and understand how the ingredients are delivered through the skin. The Internet and any retail environment are highly influenced by brand recall. If the brand name of a product is new, the consumer should not dismiss the product immediately. Moreover, the newer companies out there have something to prove and this could mean paying less for a quality anti aging skin cream. Checking the ingredients is a bit of advice that cannot be emphasized enough. There are ingredients that improve the look of the skin and those that fluff out the ingredient list. Some important ingredients to look for include: minerals (especially bio-available minerals that can be absorbed through the skin - only a few rare clays can provide that), vitamins, herbal extracts, natural organic oils like olive, jojoba grapeseed, and superfoods in their raw state like raw honey, spirulina and organic apple cider vinegar that can provide thousands of enzymes. The strength of these ingredients is also important as higher levels can mean more effective anti aging properties. 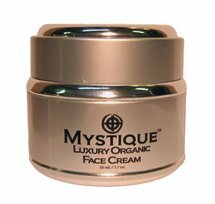 MystiqueTM is the best anti aging cream ever developed, your skin will instantly smooth, tighten and glow. Comparable to any of the luxury beauty creams like Le Mer, Revive or Sisley of Paris. What is the best way for ingredients to be delivered through the skin? Undoubtedly, certain rare clays, like those in Nature’s Transdermal Face FoodTM, are powerful vehicles to deliver nutrients through the skin. That’s why some of these rare clays are being studied as the best way of delivering drugs through the skin. When you mix one of these rare clays with oils like organic olive oil, jojoba and grapeseed oil, which is what we did with Nature’s Transdermal Face FoodTM, nutrients can literally rain through the skin. We highly recommend using this product with our other products. How ingredients are delivered through the skin in beauty products is one aspect many people rarely consider. The skin does not absorb everything at the same rate. The longer the ingredient stays on the surface of the skin, the less potent the ingredient will be. You’ll see terms like nanoparticles and microencapsulation on the labels of what some might consider to be the best anti aging cream. You do need ingredients small enough to seep through the pores of the skin, but these terms are usually just slick marketing. You need thousands of nutrients absorbed through the skin, like you have in Nature’s Transdermal Face FoodTM, and our luxury face cream MystiqueTM. The Internet is a powerful shopping tool. Use it wisely and find solid information to make your buying decision for your best anti-aging cream. If nothing else, look at your purchase of the best anti aging cream as more of an investment. With many men and women spending hundreds of dollars, or more, a year on various skin care treatments, a little research and a lot of knowledge can help to curb the cycle of buy, try and throw away. The best anti aging cream is one that will give you great results at an affordable price.